Late summer and fall are such beautiful times to get married. 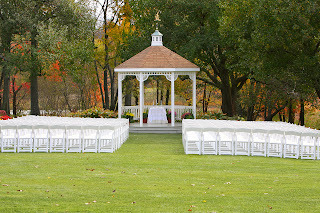 As such, brides choose to hold outdoor weddings in scenic local venues with the changing leaves or at the water's edge. The colors and atmosphere just make for a lovely memory to celebrate new beginnings. Selecting a special wedding memento for your attendants makes a wonderful memory for them too. Here are a few items you can think about when choosing a jewelry piece for your Christian wedding attendants as your personal gift to them. If you are Christian and getting married in an outdoor Christian ceremony or getting married in a church, a good choice for bridesmaid jewelry would be to go with the classic Christian cross theme. You can find beautiful cross pendants with chains in sterling silver, gold, platinum and even in stainless steel. When looking for a cross pendant to use as bridal party jewelry you want to find small gold pendants with the preferred finish being either yellow or white gold, or sterling silver. Make sure you choose a pendant that is simple, small and dainty so it won't overpower the outfits you have selected for your bridesmaids. You can find beautiful crosses that are just plain or find some with tiny cultured freshwater pearls or pastel colored gemstones in the to match your wedding colors. For earrings a great choice would be a single gemstone or cultured pearl stud set in the same yellow or white setting go along with your cross necklaces. If you want to use bracelets, then go with a charm style bracelet and purchase a single cross charm to dangle off them. Another option would be to go with a single strand of cultured freshwater pearls or a gemstone style tennis bracelet to go with your cross theme jewelry. Any of all of the Christian wedding jewelry choices would certainly look beautiful on your attendants for your special wedding day. Present each of your bridesmaids with a lovely small jewelry gift box filled with the special jewelry and you know your bridesmaids will be honored to share your wedding day with you. It is nice that we have so many choices of different metals for our fine jewelry today. It use to be just gold in varying strengths or sterling silver. Now with platinum being a great alternative, there are some differences in how to clean and care for your fine platinum jewelry to keep it bright and shining. Here are some tips for you. When it comes to taking care of your platinum or platinum plated jewelry, you want to treat it like fine jewelry and keep it protected at all times. As you are storing your jewelry pieces when not in use, they should be places in a lined jewelry box and kept separated from other pieces so that they are not lying on one another which could cause stratches. Platinum jewelry needs to be cleaned with a "fine jeweler's cleaner" or a cleaner that is made specifically for platinum jewelry. It is advised that you don't use homemade jewelry cleaners on your platinum jewelry as you don't want to damage the finish on the platinum, or any gemstones that may be set in your pieces. In between cleanings you can buff or polish your platinum jewelry pieces with a nice jeweler's soft polishing cloth to keep them nice and shiny. Diamonds and clear stones look so lovely set in platinum; very flashy and sparkly and definitely an attention grabber. Platinum is a strong metal so it can take long term wear, but make sure you clean it and store your platinum properly when it is not being worn. It will remain looking wonderful forever. And isn't that why we buy our fine jewelry anyway? Our treasured keepsakes can be worn with love and passed to future generations with pride. 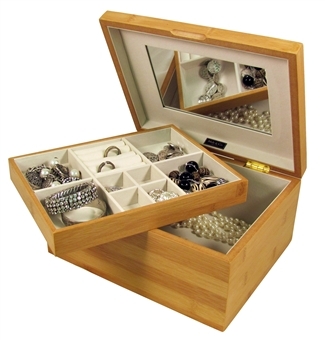 One of the best ways to store beautiful jewelry is in a wooden jewelry box, as prized jewelry deserves a fitting container. 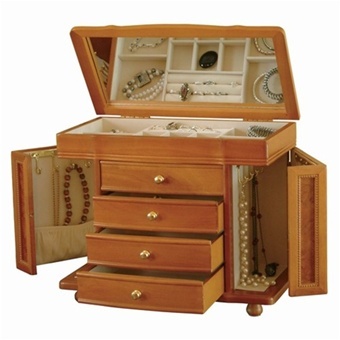 If you are considering purchasing a jewelry box for your bedroom or as a gift, it is important to know what kinds of wood finishes are found on jewelry boxes that are on the market today. The finish of a jewelry box is important because the color of the box depends on the wood that is used in its construction. Since most jewelry boxes are placed in bedrooms you should consider how its color will fit with your interior decoration scheme. For example, if you like to have everything match, choose the same finish as your furniture. If you like to mix it up, consider a contrasting finish. New let's consider the types of wood that are found in the finishes of the most popular jewelry boxes. We will start with cherry. This a premium American hardwood that is prized for its natural luster, attractive grain and rich, warm reddish glow. When you look around you will find that a solid cherry box is rare, and most boxes are constructed with other hardwoods but with a cherry finish. Mahogany is another wood finish that is reddish brown. This dark wood has a strait grain and is free of voices and pockets. If you polish the wood you will get a beautiful reddish sheen. 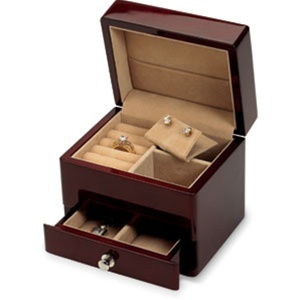 Mahogany boxes are luxurious-looking and elegant. 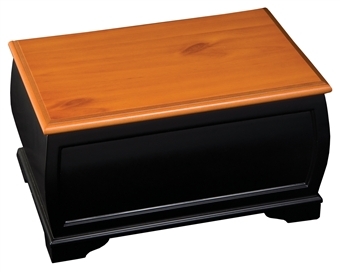 Solid natural mahogany boxes start out light and will darken with time. Another popular finish is walnut. Walnut boxes have a rich brown color and their traditional feel allows them to blend with many styles of decor. As with cherry, it is very rare to find a solid walnut jewelry box, and most walnut boxes will be constructed out of hardwood with a walnut finish applied. Burl wood is a beautiful wood often used by artists to create sculptures. Artists like to use this wood because it comes in unique shapes and has interesting ring patterns. A burl is a type of wood growth found on some trees, usually caused by environmental stress. 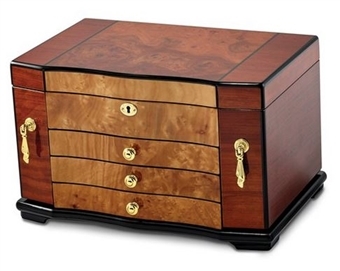 Many distinctive looking jewelry boxes come with burl wood finishes. 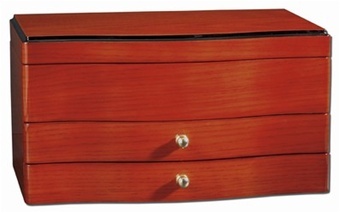 Maple is another wood finish found in stylish jewelry boxes. Maple is a hard and durable wood perfect for creating fine jewelry boxes for jewelry and watch collections. Many maple trees have a highly decorative wood grain and this adds to the beauty of the jewelry boxes crafted of maple wood. 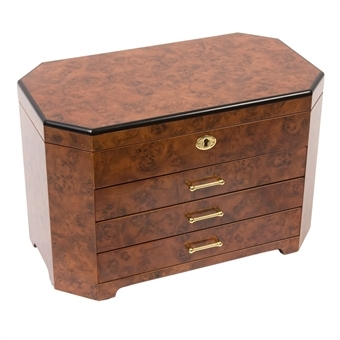 If you want an heirloom jewelry box then teak is a perfect finish choice because it has high durability and is also quite beautiful. This highly durable wood lends itself to designs for both men and women and is well-suited for boxes that are meant to last for generations. It will stand the test of time. You may not have ever heard of bubinga, a rare wood from West Africa, but it is often found in distinctively decorative jewelry boxes. Bubinga was first used in making musical instruments but is now a preferred wood choice for eye-catching jewelry boxes that are out of the ordinary. I'll conclude with a common American wood finish, oak. 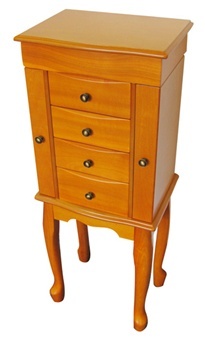 You can find a number of dresser top boxes, floor standing armoires and watch boxes with warm oak finishes. 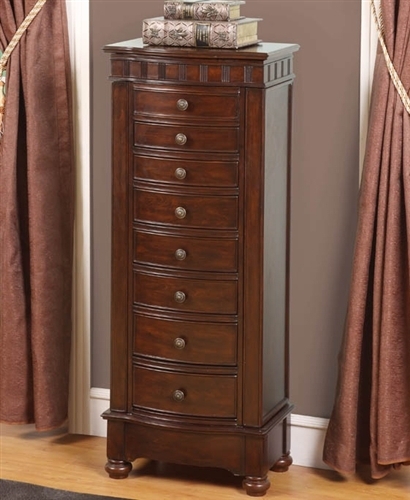 You probably won't find a solid oak box, as most oak-finished jewelry cabinets are made with a combination of hardwoods with an oak finish, but an oak cabinet in your decor will impart a touch of timeless beauty to your bedroom. These are the most popular wood finishes for contemporary jewelry boxes and now that you know what to expect it is time to choose the jewelry box that is best suited for you! One of the best statement pieces of jewelry, the necklace has proven itself over and over again in the fashion world and in our own jewelry box. There are so many different ways that we can use a necklace. We can use one to stand out in a crowd or to look professional. We can use them to look edgy and modern. How about romantic and ladylike? Yes, there is a necklace for that too! This fall, we are seeing some wonderful necklaces that will allow us to incorporate our statements to society. Here are 2 great necklaces that you need to look for and add to your favorites list. I know I am. One of the hot items trending right now is Initial Pendants in white or yellow metals. You can find them with or without gemstones. The Initial Pendant uses a rather large size pendant, measuring from 1 1/2" to 2 1/2" in length. This stand-alone initial is most preferred although having a circle, square, heart or rectangle engraved with your initials is also being seen too. The majority of people wearing initial pendants wear the first name initial although some married women are wearing the initial of their last name. These look great when mixed with other necklaces or wearing them alone can be a lovely fashion piece. You will see them on long length chains, ribbons, and leather cording. Circle pendants also known as Eternity Pendants are another big trend for Fall 2011. You will find circle pendants with gemstones (real and faux) in a variety of metals like sterling silver, stainless steel, yellow gold, rose gold, white gold and platinum. If you are going to sport this trend look for circle pendants that are 2" to 3" in diameter and wear them on an 18" or 20" neck chain. Both of these necklaces look stunning together or by themselves. The great thing about wearing pendants is that you can easily change the look by changing what it is worn on; cord, ribbon or chain. Necklaces are extremely versatile and that is why they are a great choice for your fall style. Today we pause to remember the 10th anniversary of 9-11. 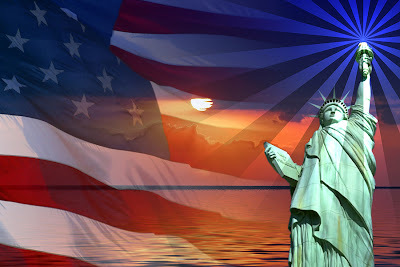 Our hearts go out to this great nation. When it comes to making sure your wedding party is dressed to the nines, all it takes is a little planning on the bride's part. When selecting jewelry for your bridesmaids, don't forget about your flower girl. Matching her outfit and jewelry to the rest of the bridal party is a beautiful, finished look. As you are looking for the proper jewelry for your special day, remember that flower girl jewelry should complement the jewelry of the bridal party but it should be smaller scale. 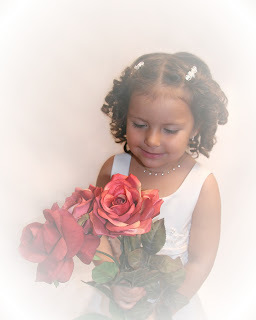 You don't want to purchase jewelry that is made for adjusts for a little flower girl as it won't fit them properly. One good choice that many brides make is to pick out cultured freshwater pearl jewelry that is accented with clear rhinestones or Swarovski crystals to give it that "glittery" feeling. This type of jewelry is easy to match in large and small scale. For the flower girl it is best to go with a single strand of 3-4 mm cultured freshwater pearls in a natural or pastel shade. Since children tend to dance and move around a lot at big gatherings you should make sure that all necklaces & bracelets have good secure clasps so that they don't lose their jewelry during the festivities. If your flower girl wears earrings, they should be kept on the small side so you could go with a 3-4 mm cultured freshwater pearl stud earring or a sterling silver fish-hook styled earring with a tiny pearl drop. By choosing the smaller scale items for her, you will not overwhelm the delicate frame of the girl and it is appropriate for you wedding day and the dress selection too. As with your bridesmaids, present your gift to your flower girl in a gift presentation case. Perhaps a keepsake wooden ballerina music box that she will enjoy long after the wedding. You want your gift to be a treasured keepsake that your little flower girl will look and wear with stars in their eyes, just waiting for the day they will be a bride too! Fall is the perfect time of year to enjoy new jewelry. We need to have a reason to shop for something new, right? 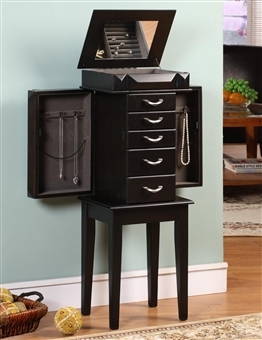 Why not beautiful necklace options and a lovely standing jewelry cabinet to store it all in? When you see the new styles of fall necklaces, you are going to need the space because you'll want all of the beautiful necklace trends! One lovely look we have seen is Stainless Steel Pendants and Chains. These have continued to grow in popularity and are a huge hit for Fall 2011. The stainless steel jewelry lines continue to grow in popularity due to the durability, availability and affordability of stainless steel. We are seeing a lot of "hippie style" stainless steel jewelry being sported around by Hollywood and New York celebrities like the "peace sign"and "crosses". Free-form pendants that are nature-inspired are looking good too, especially when they are large and bold in size. When purchasing stainless steel pendants you will want to match them up with stainless steel neck chains or thread them onto a leather or vinyl cord. Also a ribbon with a silver or stainless steel clasp would be a beautiful touch. Because of the color, these pendants will go with any color in your wardrobe and will look amazing! Another beautiful trend in the fall fashion lines that we are seeing is the layered look when it comes to necklaces. You can purchase a variety of neck chains in varying lengths and do your own custom layered look or you can save yourself the trouble and purchase a layered necklace that has already been assembled for you. Look for the colored metals (two-toned look) being mixed together along with plain chains, chains with pearls and lovely gems mixed together with chains that have charms dangling off them. These layered necklaces look great with Fall turtle-necks, cowl necks and with tweed jackets heading into winter. Very classic! It doesn't cost a lot of money to look stylish all season long. Grab some of these stunning necklace looks and you will be in the height of fashion and still have money left for the lovely jewelry armoire that you are going to need! Our top three travel jewelry cases for ladies will provide safe and secure jewelry storage on your next business trip or vacation. They also make great gifts for those on your gift list that travel for business or pleasure and are always on the go. 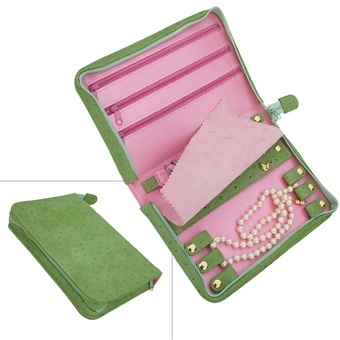 A favorite choice for traveling with a small collection of fine or delicate jewelry is our Pink and Green Suede Travel Jewelry Case. It is crafted with a richly textured grass green faux exterior that opens to reveal a fresh and luxe pink suede interior and was designed for traveling with necklaces, chains, pendants and earrings in mind. A zippered closure surrounds the case and it opens to dual jewelry storage sides. One side offers three satin-lined zippered compartments for chains or pendants; the other side offers an ostrich earring strap and three snapped tabs to keep necklaces tangle free. To keep necklaces from moving around, there is also a protective necklace flap. Sized perfectly to slide into a purse, backpack or carry on: Length: 8 1/2" x Width: 5 3/4" x Height: 1 1/2"
A favorite choice for traveling with a mid to large jewelry collection is our Black Leather Travel Jewelry Box with Lock. The premium leather exterior is crafted in a unique train case style and is finished with a classic quilted design. 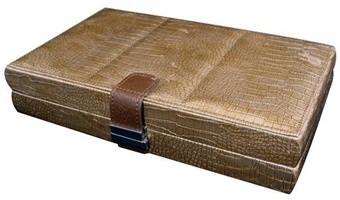 The interior is fully lined in sueded fabric to cushion and protect your jewelry. Designed with the stylishly chic lady in mind, this gorgeous jewelry box comes with the added security of a pave crystal lock. It even comes with a take away mini case for weekend get aways and trips that don't require a lot of jewelry. Jewelry Storage Features include ring rolls, divided jewelry storage sections, tray and a divided jewelry drawer and a bonus travel mini case for earrings and rings. Length: 10 7/8" x Width: 7 3/4" x Height: 6"
A favorite choice for traveling with necklaces and rings is our Sleek Flat Bronze Faux Leather Travel Jewelry Box. The unique shape and finish of this jewelry case make it bold and beautiful. It offers and endless array of storage possibilities the will make it your constant traveling companion. With a slim profile and sleek pantina, it is just right for the jet set! 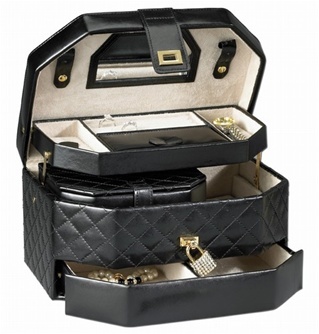 With dual sizes offering a creative use of space, the jewelry storage features of this travel case are impressive. One side features eight necklace snaps with a shirred catch pocket. The other side offers a large ring roll section, one covered compartment and three removable pouches. This case is also fully lined in an ivory sueded fabric for added cushioning and protection of your jewelry while traveling. The slim design allows for this case to fit nicely into the corner of a suitcase or carry-on. While at home, it slides nicely into a drawer. Length: 11 3/4" x Width" 7" x Height: 2 1/4"
Choose one of these jewelry travel cases for your next business trip or vacation and your jewelry will stay safely organized during your travels. There are a lot of important factors to consider when selecting jewelry to take with you while traveling. We invite you to read our previous blog post for more information about traveling safely with your fine and fashion jewelry. Although you want to look nice when you travel, and have bought your jewelry for that purpose, traveling with jewelry comes with higher risks than you have at home so it is important to take precautions and travel wisely. Let's look at the things you should consider when traveling with jewelry. First, before you even begin your journey it would be prudent to leave your most valuable items at home and select less-precious substitutes from your collection to use and wear during your travels. Once you have selected your items for the trip, do not put them in your checked baggage. Secure them in a sleek jewel travel case and carry them in your purse or other carry on baggage. Always remember that prominent display of jewelry on your body can be a magnet that attracts theives. So use discretion when you dress and go out on the town. If you are traveling to developing countries, places where there is acute poverty alongside wealth, the risk of robbery increases so it is better not to stand out with an excesive display of jewelry. Also, if you are staying in a hotel it is best to keep valuables in the hotel safe. Your hotel room is locked but hotel staff can get entry to your room. If you are going to the beach then remember that many jewelry items find their way to the sand and are picked up later by lucky collectors with metal-detectors. Rings slide off when you apply lotions, and if you are snorkeling in the ocean, the cold temperatures cause a constriction of your fingers causing rings to slip away. If you are on your honeymoon, you don't want your new rings to reach the bottom of the ocean! While you are traveling it is good to keep your jewelry organized as this will make it less likely that you will misplace and loose some items. When you are home you have the luxury of misplacing an item and finding it a few days later, but not when you travel. One way to stay organized is to place your jewlery in a jewelry wallet with separate compartments for earrings, rings, watches and bracelets. These wallets fold up and are compact for easy and secure packing. Despite all your bes precautions it is always possible that you may loose something during your travels, that is why it is good to carry some kind of insurance on your belongings. Don't assume that your present homeowner's insurance covers losses during travel. Check your insurance policies to see what is actually covered. Even if you do havea policy that covers travel, make sure that your insurance policy can cover the cost of what you are bringing along and if not, it is best to leave the more expensive items at home. 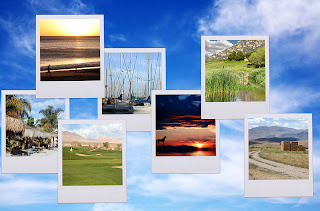 Follow the above-mentioned tips and then go out and enjoy your trip! Today there is an increased interest in handcrafted goods and jewelry. The work is unique, exquisite and can be very delicate. You will find many modern jewelry pieces that have been made with handmade lampwork beads. These beads are tiny works of art so it is important to take care of them properly to prevent cracking and breakage. 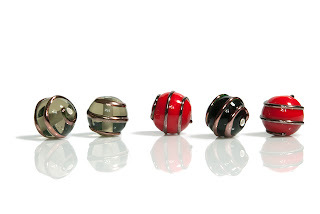 What is a Lampwork bead? Lampwork beads are handmade by expert artisans one at a time by melted glass around a steel rod that has been coated with a clay called bead release. They are then heated up via a torch and flame to a temperature of 120 degrees F. The expert artisan then spins or winds the glass around the steel rod to produce colorful designs and until it reaches the size they are trying to acheive. When done, the artisan places the beads into a kiln until it reaches a certain temperature and then it is cooled. With such attention to detail, the result is wonderfully unique, one of a kind, delicate glass beads. Caring for them is important for long lasting wear. You can clean your lampwork beads with a soft cotton cloth that has been lightly dampened and then towel dry. Most beaded jewelry is strund on beading threads, elastic or wire of some sort. Depending on the material used to string your lampwork beads, take caution in not soaking the jewelry in water. Water can cause the beading threads to stretch out and wears on elastic or wire over time. You will also want to make sure you store your jewelry that has been made with lampwork beads in a softly lined jewelry case with a lid so that they are always protected. Wearing your beautiful lampwork bead creations will always be enjoyable if you care for them and take some caution with them. Since they are made of glass, breakage could occur. Removing your jewelry immediately after use will extend their life and your wearing pleasure. Handmade lampwork jewelry creations are certainly worth the extra effort in cleaning and caring for them. You will be able to wear them for many years. One of the great things about precious stones created naturally through the earth process is the absolute beauty you can find in no other process. Amber is one of these amazing stones that have quite a history. Amber has the unique ability to absorb and preserve the organic materials it encounters as it is created. So when you look into a piece of amber, you may see tiny organisms, frozen in time. Because of the uniqueness of this stone and the jewelry made with it, here are some care tips to follow. Because of the composition of Amber, the stone and settings are very sensitive to dramatic changes in head or cold so always store your jewelry in a room temperature climate. 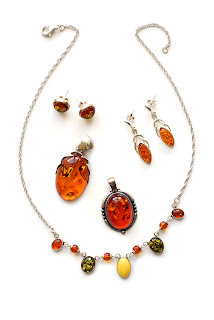 Amber jewelry should be stored separately from your other jewelry pieces as it can scratch and dent quite easily. When you wear your precious amber jewelry, make sure you put it on last as you never want to apply hair products, cosmetics, skin care products etc. while you are wearing your Amber jewelry. In addition, do not use chemical cleaning products while wearing your rings and/or bracelets as chemicals can damage jewelry made with amber. To properly clean and protect your Amber jewelry you will want to use a mild liquid dishwashing soap and a soft cotton or microfiber cloth. Make sure you rinse it well and towel dry immediately. Do not let this stone air dry as the water drops will mark the stone. Remember this is a very delicate stone, so take care to treat it as such. 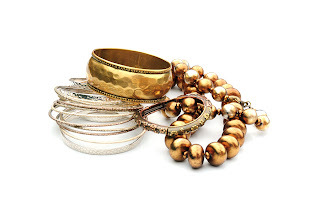 After cleaning or wearing them, place your pieces in a softly cushioned jewelry box for safe storage. The amazing quality of a piece of amber jewelry is worth the bit of diligence in caring for it. As you look at the stone in depth you will see the awesome beauty the amber imparts, so enjoy your special pieces and wear them proudly. The gift a bride gives to her bridesmaids is an important memento of your special day. A trend we are seeing with bridal jewelry for Fall and Winter 2011 is many brides-to-be are purchasing personalized jewelry for their bridesmaid attendants to wear during the wedding and reception ceremony. It is a beautiful and thoughtful gift that will be treasured. One type of personalized jewelry for your bridesmaids is the initial pendants that represent the bridesmaid's first letter of ther first name. You can find these with sparkling crystal set in to give her some glitz and glamour. They come in a multitude of sizes so the choices available are large and you can easily find the perfect one to fit your wedding theme. Another great bridesmaid gift idea is a pendant with the bridesmaids initial or first name beautifully engraved on it. These also come in a large array of styles and sizes so you can match all of your attendants or mix and match a bit too. We are seeing these personalized wedding jewelry items in the gorgeous white metals like white gold, sterling silver, stainless steel and silver-plated lines of jewelry. Regular yellow Gold is always and option too. Also include a pair of stud or dangel earrings to match or coordinate with the necklace that you purchase for them. Add a lovely cleaning cloth for sterling pieces as well as storage and care tips. Once you have everything assembled and ready, wrap it up in a pretty little presentation gift box and tie a pretty sheer ribbon bow around it for gifting at your bridal shower or the morning of the wedding service. By keeping your wedding jewelry choices uniform and simple with lovely personalized necklaces and matching earrings, your wedding attendants will have the perfect jewelry to match their dresses and tie your theme together. They will certainly love your wedding thank you gift and treasure it for a long time to come. Your wedding is a special occasion and you will surely want to show your appreciation for your bridal party with a special gift. A pretty jewel case is a keepsake that will be treasured by your bridesmaids and maid of honor. There are a number of possible choices in this category that would make excellent gifts for your wedding bridal party and I would like to show you some of the best ones. 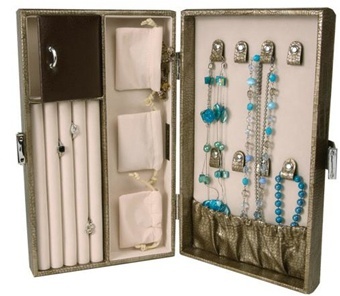 An excellent choice is the small travel jewelry case with crystal clasp made by the Mele Jewelry Box Company. 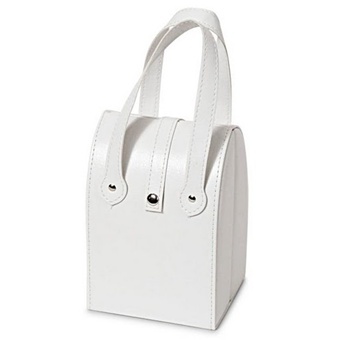 It is made out of faux leather and is available in ivory or black. It has a clear viewing lid and features three open sections and one set of ring rolls. Its ivory sueded fabric lining protects jewelry and its tabbed closure has a ten-stone crystal flower snap. 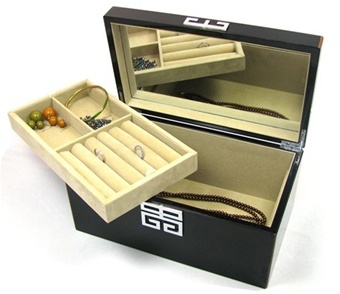 Measuring in at 7 3/8" x 5 7/8" x 2 1/2", this box offers compact and stylish jewelry storage. With a list price of $42 and a reduced price of $29.95 it makes a great gift that will not break your budget. 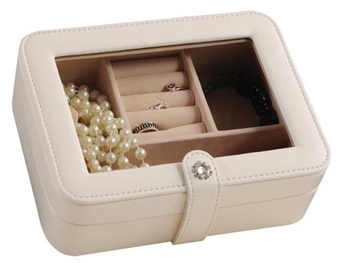 Another popular choice is the small white leather purse style jewel box made by Morelle & Company. This travel jewelry box is petite in size with a refined sense of elegance. It has two top handles, and its leather tab opens to a storage area for necklaces, bracelets and other jewelry accessories. The purse style box provides convenient storage for jewelry during travel, and it also has two tabs designed to hold earrings and chains. Its soft white leather finish and chocolate brown velvet interior give it a lovely and elegant look that is sure to please your bridesmaids. The box lists for $55 but you can save money and get it for $34.95, plus it comes with a free crystal necklace. 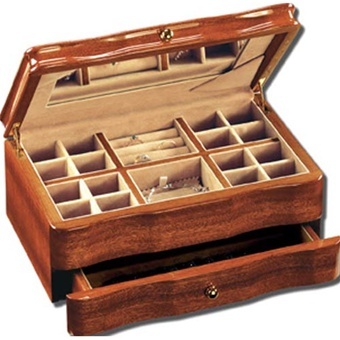 Some of the most popular keepsake jewelry boxes are wooden. 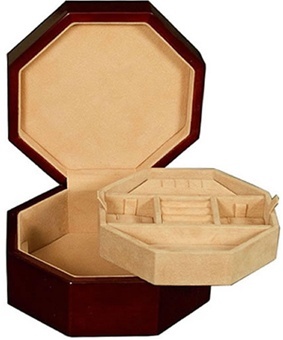 An octagon shaped small wooden mahogany jewelry box imported by JW Global, Ltd is perfect for bridal party gifts. It sports a mahogany high gloss piano finish and features a divided lift-out tray. It has a tarnish resistant lining and with compact dimensions (6 x 6 x 3) it provides surprisingly spacious storage space for rings, charms, chains and earrings. This popular keepsake gift is well worth the sale price of $54.95. 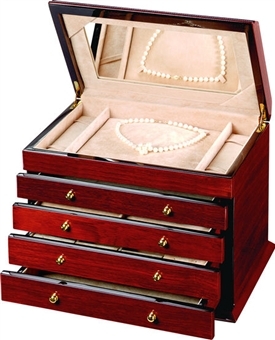 Another popular wooden jewel box that is sure to delight your bridesmaids and maid of honor is the small mahogany jewelry box with drawer, also imported by JW Global, Ltd. 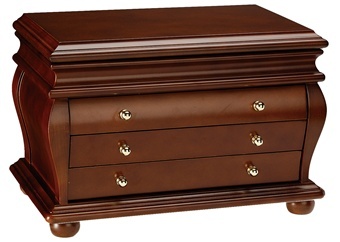 It is made of solid wood and features a high-gloss mahogany finish. 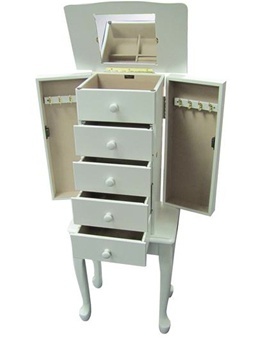 Its top section comes with ring rolls and room for jewelry storage. Its drawer has divided compartments, and a tarnish resistant lining. The hardware is silver, and the overall look is charming. Once again, this is a keepsake gift that is modest in price. It lists for $85 but you can get it for a reduced price of $58.95. These are but a few of the leather jewelry cases and wooden jewelry boxes that could be the answer to your search for the best gifts for your bridesmaids and maid of honor. It is great to see what wonderful items the designers of jewelry find each year for our style delight. This summer we have been seeing some wonderfully traditional trends and also some eclectic choices. Here are a few more that you can enjoy for the remainder of the season and to carry you into the fall. Nature inspired jewelry has been a great choice for women this season. It is fresh and brings the love of the outdoors into your accessory selection and into your style. It is a fun crossover and can really birghten your mood. Take a look at some neat pieces that can really show your flair for classy accessorizing. Jewelry items that are depicting animals like dragonfiles, butterflies and bumble bees are the perfect seasonal jewelry accessory. You can find great pieces made with crystals or enamel in wonderfully bright citrus colors that are set in sterling silver or white gold. These look amazing on and will set you apart from the everyday typical accessory. 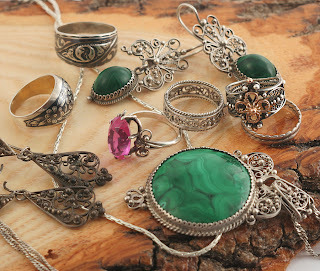 Look for jewelry in sterling silver or yellow gold that depicts items found in the great outdoors like flowers and trees. You can see these created in all metal jewelry pieces or pieces with bright gemstones. These beautiful art createions will look awesome with your clothing and will become a wonderful statement that you will enjoy wearing often. Seasells, starfish and sand dollars are hot and you can purchase these designs in various types of metals. For those who love sea life, go for jewelry that depicts dolphins, seahorses or whales. What a fun selection to enjoy and celebrate the great outdoors with. Birds in flight are an international nature inspired jewelry trend. Aside from charm pendants hanging on gold or silver chains, we are seeing long necklaces with birds incorporated into the side of the chain. It's usually a dove or seagull featured on a dramatic long necklace and they lend an air of sophistication with a touch of softness to any outfit for a casual weekend, or dinner out. By buying a few of these great pieces, you will certainly make a difference in your wardrobe and accessory choices each day. These wonderful nature inspired jewelry pieces are very striking and they won't sit in your jewelry box for very long. You will find yourself reaching for one of these day after day and the compliements will come rolling in too. Enjoy!